Stunning work, Debbie! I am following you. Liked and Favorited. Thank you, I love painting fish. Debbie, I absolutely LOVE this! 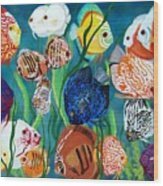 the bright colors are just yummy and the various patterns on the fish are wonderful. Voted/Like/Pinning on my Oil Paintings board and my Animal Photos and Art Images board on Pinterest. Hope that brings you some views and sales! Thanks for the great comments & I sold the original this weekend to a great home, YAY! Debbie, Stunning Work!! Congrats on your sale! Thanks, this has been one of my best sellers on FAA and it's so funny because the original is still for sale. So much detail! great work! congrats on your sale! This is a wonderful piece, Debbie. Congratulations on your sale! So colorful...beautiful. Beautiful work, so colorful and cheerful. voted. So many vivid colors and patterns. Congrats on your sale Debbie. Thanks, fish are one of my favorite subjects. Hi Debbie. What a delightful painting! 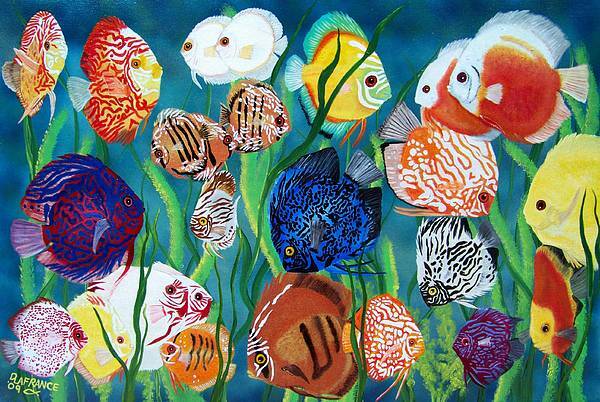 This a colorful, fanciful painting of Discus Fish. 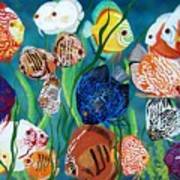 The fish are true to color, showing the many variations of this type of fish.